There haven't been too many sales within my portfolio and just glancing at the post labels gives you a hint of the relationship. 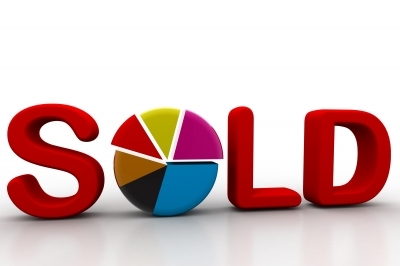 There's over 130 Recent Buy articles, but this is only the 10th Recent Sell article. So, it's pretty obvious that I prefer to make purchases, but sometimes there's other factors at play and a sale is necessary. On Thursday, September 15th I made the decision to sell 14 shares of my 42.038 share position in Norfolk Southern (NSC). I sold the 14 shares for $91.66 per share which netted me $1,275.26 after commission and fees. I'm going to look at the returns a little differently than normal since I only trimmed the position rather than close it completely. The first lot of 7 shares was purchased on September 25, 2012 for $65.54 per share. The second lot of 7 shares was purchased on October 31, 2012 for $62.36 per share. I'm pretty happy with 39% and 46% capital gains especially since that works out to 8.6% and 10.3% compound annual growth rates. Keep in mind that's without accounting for dividend payments which only boosted up the returns. Since I've reinvested all dividends from Norfolk Southern it was simply too much effort. Those dividends came from 3 different lots that were purchased outright and 16 different reinvested dividends. So it wasn't really worth the time and effort to properly allocate each dividend payment to just the shares that were sold here. However, I do still have the following table that shows the investment transactions/cash flows and the internal rate of return through yesterday's close at $93.11. This table accounts for all purchases, dividend payments, reinvested dividends and the trimming of 14 shares. Overall I'm pretty happy with a 13.5% internal rate of return when looking at every transaction involved in Norfolk Southern. In case you don't know Norfolk Southern is a railroad company operating approximately 20,000 miles of track primarily in the Midwest and Eastern portions of the United States. Norfolk Southern is diversified across many different industries and customers to generate revenue for the company. 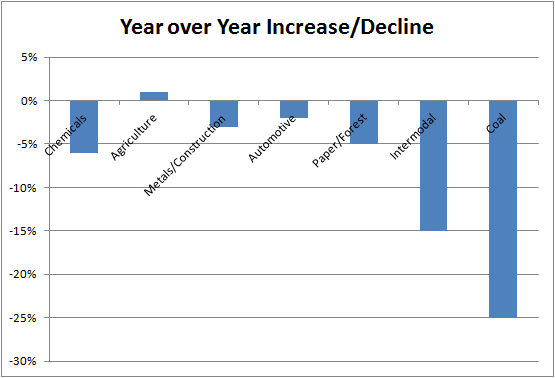 Railroads in general have been put under pressure as the economy just slowly trudges along leading to declining shipments of just about everything. 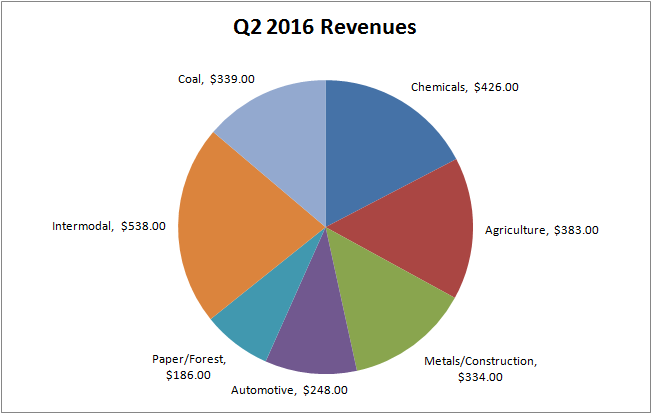 Declining intermodal revenues and coal shipments have been especially bad for Norfolk Southern since even after the decline the two combine for approximately 35% of Q2's revenues. Compared to 2015 every segment but one, agriculture, shown a year over year revenue decline. That alone wasn't enough to force my hand because Norfolk Southern is still doing fine and I don't think the railroads are going anywhere. They're just too efficient of a means to transport a large quantity of goods across lengthy distances in a quick time. The dividend has also been kept steady now for 7 straight payouts and if it's not raised in October (the December payout) the dividend growth streak will come to an end. That's a little disheartening since the streak is up to 15 years now giving them the title of Dividend Contender. 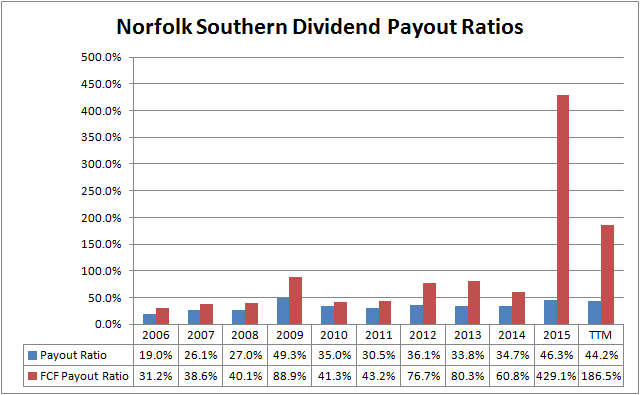 If you look at Norfolk Southern's dividend history from above they do periodically have to keep the dividend steady with 16 quarters without an increase in the late 1990's, a 6 quarter stretch centered around the Great Recession and this current 7 quarter run they're in now. However, what really concerns me is that the late 1990's run ended with a massive 70% cut in the dividend payment. So managements' commitment to the dividend might not be the strongest, although I do applaud them for being able to maintain the dividend payment in this otherwise challenging environment although that time may be coming to an end. Yikes! To say that 2015 and thus far in 2016 has been hard times is an understatement. I do want to note that the free cash flow payout ratio is taking the free cash flow value on the surface. Free cash flow is much bumpier depending on the timing of capital expenses and some capital expenses are one time purchases that would only effect free cash flow in one year. That being said it's still something that needs to be examined a bit closer given that the free cash flow payout ratio has jumped tremendously. All that being said, I made the move primarily for diversification within that portfolio. I owned the shares within my Roth IRA so there's no tax liability on the gain. Although since it's in a Roth IRA I also want to make sure I'm invested in companies that have a high likelihood of continued growth and long term wealth building. After all, you can't write off any losses for tax purposes on holdings in a tax sheltered account so I feel you should be more conservative in your holdings there. Unfortunately any time you sell a position that means you no longer get to receive dividends from the company. Norfolk Southern's current yield is 2.53% and losing these 14 shares reduces the annual dividends within my Roth IRA by $33.04. That hurts but it's not the end of the world. Lucky for me though a dividend yield of 2.5% should be pretty easy to beat with other investments. If the sales proceeds are invested at a 3.0% starting yield that would immediately boost my dividend income by over 15%. A 4% yield would represent a 50%+ improvement. 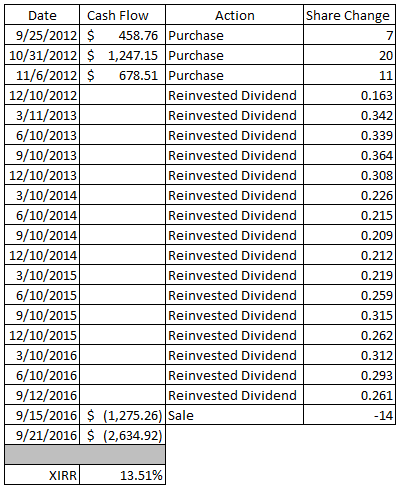 My FI Portfolio's forward 12-month dividends stayed the same at $5,477.56. My Loyal3 Portfolio's dividends are still at $65.06 which brings my total taxable account forward dividends to $5,542.62. My Roth IRA's forward 12-month dividends decreased to $240.69. What to do with the proceeds? Proceeds from the sale came to $1,275 and adding that to the ~$650 I already had in the account leaves me with about $1,900 to invest in a new to that account position. I'm leaning more towards something safe and stable such as Johnson & Johnson (JNJ), PepsiCo (PEP), Realty Income (O) or the like although all 3 of them would likely need to offer a bit more value before I pull the trigger. If anyone has any suggestions for "long term buy and hold reinvest the dividend" purchase candidates please share. Do you own Norfolk Southern or any other railroads? Have you trimmed a position for allocation reasons or do you typically just let it ride? What companies, if any, look like good investments at this time? I sold just off my position of WFC last week actually. I ended up picking up ABBV and RY.A good Value dividend stock right now is XOM. The price is at a great valuation with about 14% from the 52 week high. I also have my eyes on PG and EMR. Although, I'm waiting for PG to pull back a bit. What was your reasoning for selling off WFC? Just concerned about a deeper rooted issue and more fines/regulation coming down the line after the accounts scandal? I think JNJ looks decent here, but there's not a whole lot that I like. I need to do a bit more investigating though because I haven't been following the markets that closely since I wasn't planning on putting any capital to work. But here we are. Nice job locking in those gains, NSC has had quite a year. Being able to lock in gains definitely played a part in the reallocation decision. I'm looking forward to investing this capital to get it working once again for me, but there isn't really anything that's really caught my eye. I might need to check out FLO since lots of other bloggers have been buying them up. Definitely seems like it warrants a look over. Any interest in TGT, TROW or T? Just curious! No TGT for me because it's already a big part of my portfolio. TROW and T could be possibilities for this cash. Thanks for sharing some other ideas.